Medicare for all could be funded by this little known tax! This entry was posted in medicare supplement and tagged 2019, Affordable Care Act, Can Tax Pay for Medicare, congress, Funding Medicade, Health Insurance, how much does medicare cost, Medicade Tax, medicare, Medicare for All, Paying for Medicare, politics, Senate, single payer, Tax and Medicare, thom hartmann, WASHINGTON. Bookmark the permalink. The VAT taxfor cars in Germany can have funny effects, e.g. when you import a car there is a special tax rate for the light bulbs in the car. For the U.S. the VAT would have some disadvantages. Introducing the tax would require the nation to establish a new tax collection administration. It would force businesses to set up new procedures to collect the tax and send proceeds to the government. This is a more costly undertaking than boosting tax rates in an existing tax, such as the payroll or income tax. Also, establishing a VAT would involve tough political negotiation between federal and state lawmakers, since most states fund an important percentage of their operations with a sales tax. To keep tax collection efficient, a federal VAT would require some coordination between the collection of the VAT and state sales taxes. These problems can be surmounted, as they have been in other OECD countries, but the solutions would not be painless! US Fed Govt doesn’t require our $ to pay for anything. Everything at Fed lvl is funded thru creation of new USD by Congress when they spend. F.Y.I. The U.S. Treasury may control the printing of the currency in the United States, however, it is the Federal Reserve Central Bank that has 100% control of the money supply through its powers to create credit with interest rates and reserve requirements.The Federal Reserve notes are created from nothing and is backed by nothing, lending it all into existence with interest, to our Government, businesses and private individuals. It lends its Federal Notes to our Government in exchange for bonds whenever needed by Congress and can sell those bonds/debt to other privately owned central banks when they feel a need for it or if others will accept them. It is the Fed.Res. and not our Congress that determines the the need for currency in circulation and the making of new monetary policy. Federal Note creation doesn’t even have to be physical either since the central bank can simply imagine up new dollar balances and credit them to other accounts. Many countries are now moving away from the Federal Note Dollar with a nod from President Trump and to the dismay of the Fed.Res., putting greater pressure on them to avoid a crash without being blamed, which is now a mathematically impossibility to avoid by 2022. +-KITN- KittilsVogel Federal reserve notes are backed by the productive capacity of the US economy, as it hasn’t been tied to gold since 1971. Its use is driven by taxation. When Congress spends, the Fed is instructed by Treasury to add to reserves. The sale of bonds removes those reserves driving up the interest rate.Those reserves are put in place with previous spending. The fed can easily lower interest rates to zero by not selling bonds and just let those reserves pile up. Spending and taxation by Fed Govt are 2 different operations, taxation and bond sales do NOT fund Govt spending. +-KITN- KittilsVogel “Many countries are now moving away from the Federal Note Dollar with a nod from President Trump and to the dismay of the Fed.Res” Means nothing, Japanane yen isn’t a world reserve currency its doing fine. If the world wants to get rid of US dollars it can do so in 2 ways, trade for another currency or invest in the US whats the problem here again? I’m going to agree with you on your point. Why would the manufacturers eat that cost? I don’t get what he is saying here. I do agree with a lot of his points of view but not this one. He explained it at the end. Were you even listening? It is similar to a sales tax, but is eaten by the corporation, and it encourages domestic production and helps the economy. What’s the point of coming to a video and not even listening to it? He just said most of it is absorbed in the manufacturing. IDK I live in MA we’re taxed on everything except uncooked food and clothes, and mandatory high cost insurances. I’m really 50/50 on a VAT: it seems to work very well for Europe (well except for tech like phones/computers/etc. Where the prices can be hundreds more than in the US). My worry is the current sales tax system in many US states (shout-out to Washington…) disproportionately effect the poor and middle class. I don’t know how much I would trust Congress to come up with a solution that doesn’t just turn out to be another handout to the wealthy. Why because the politicians and the medical industry want to stay obscenely rich! What about a Tobin Tax, the EUROPEAN Union raises 20 some billion dollars a year. US employers say, End the job-killing Insurance premiums. Wouldn’t it be nice if we’re all taxed the same and we got to choose where my taxes went then we would see where people’s real loyalties lie. OR, you could just take it out of the Military budget which has yet to pass an audit. There is enough money there to give everyone free healthcare AND higher education. We need a tax on wall street SPECULATION. Wait…. you dont have that? Sounds great ! Why don’t we do it? However, the original GST was instituted as a *replacement* for the tax on manufacturers! Although we did have the type of tax that you described in this video once upon a time, there *hasn’t been any such thing* since the Mulroney Administration. And our federal and provincial governments do *not* use the GST/PST/HST to pay for healthcare. It’s paid for mostly from a health tax on employees, that all employers (except those who work for themselves) must pay. And in some provinces (like Ontario), if your gross annual income is above a certain amount, you must pay an additional health tax when you submit your annual tax return. 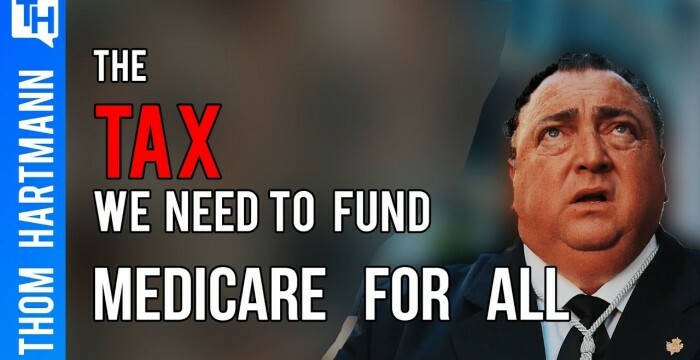 We do not need to fund Medicare for All using taxes. It should be a pure universal social service, thus funded by the Government deficit. Why spend on vital healthcare services only to tax it all back? You want to use taxes to limit inflation and redistribute wealth, period. Taxes are not needed to pay for a single thing at the Federal spending level, only at the local state level. Know your monetary economics!!! vat tax. Won’t this just end up raising the prices on everything including the things the poor have to buy? Thom, vat has the same effect, it’s just a centralized sales tax. Thank you, always wondered about VAT tax, but never thought to to ask! The reason the US doesn’t use Value Added Tax is because it is just one step away from the Labor Theory of Value, and the US is afraid of any and everything remotely considered Marxian.